There are many elements that go into a website: design, images, copy, structure, coding, and the list goes on. All of these are important, but the single most important factor that impacts your website’s success is planning. To see what I mean, think about the process of building a house. You wouldn’t just call up a contractor and say, “I’d like a house, please. How much will that cost, and how soon can you have it done?” Before you can start building a house, you need land to put it on, a building permit, financing, floor plans, and architectural drawings. The more details you can plan out ahead of time, the more cost and time-efficient the project will be. Building a website is much the same. Before your web designer can write a single line of code, they need to know your goals and expectations for your website and have a detailed plan and sitemap in hand. Unfortunately, too many people focus on the wrong things when planning a website. They get hung up on design elements or some cool feature that they want. That’s like picking out the curtains for your house before you even have a foundation. So we’ve developed a framework (with a downloadable template at the end) to help make your next web project a success. This guide is intended for small businesses and organizations who are working with a professional web designer and looking for simple steps to get started with a new website project. Most businesses want to drive sales with their website. However, when you look at this list you might want your website to do all of these things. Try to identify one primary goal, and prioritize secondary goals in order of importance. Websites that try to be all things to all people all at once often end up confusing visitors, because they aren’t sure what to do next. For example, say you have an e-commerce website. Your primary goal is obviously to sell more products. But customers also want to see videos and reviews of products in action, so education is also important. You would likely arrange your website with helpful resources on the product pages themselves, with buying-oriented calls to action. This helps accomplish both goals but puts the emphasis on driving the purchase. For example, if your goal is to generate more leads, keep track of how many requests for quotation you get via your website. Tracking software can make this easier, but even a simple Excel spreadsheet will work. 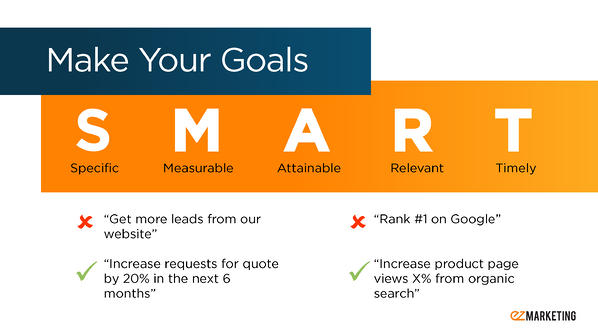 Once you have a baseline, set a realistic goal for how many leads you want to get from your website each month. One of the first questions we get asked at the start of any website project is, “How much will this cost?” Our answer is usually, “It depends,” because we don’t yet have all of the details we need from the planning process to provide an accurate estimate. Still, when starting to plan, it’s important to have some mutually understood concept of budget in mind. Before you can start planning the look and features of your new website, you need to know who you are as a business, who your audience is, and what your message is. If you’ve done an overall marketing plan, you probably already have a strong grasp on this. For your website, think about answering these three questions for your visitor: Who are you? Why should I care? What do you want me to do? This is especially important if you’re a small business in a niche industry, without much brand recognition. Take our client Sechan Electronics, for example. They manufacture electronics for military equipment, which can get very complex and technical. 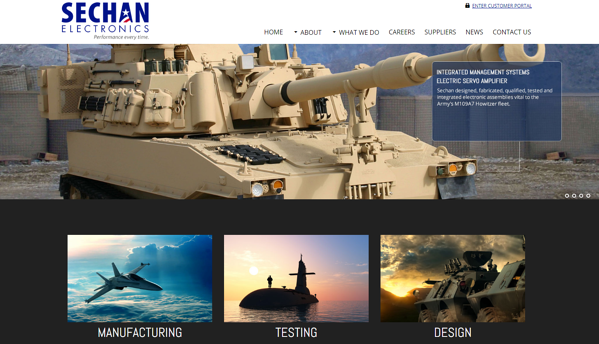 But their homepage makes it clear, even for someone non-technical: they make electronics for tanks (plus, planes, helicopters, etc.). Another important part of who you are is the purpose or mission of your brand. As noted speaker Simon Sinek points out, every business knows what they do, but very few are able to express why they do it. Websites that speak to your why can set your business apart from your competitors. Once you know what matters to your customers, you can start talking about how your product or service can help them. Just don’t fall into the trap of self-centeredness! Unfortunately, too many businesses forget about their audience, and only talk about themselves and how great their products and services are. Think back to your goals. What do you want your website to accomplish? If you’re like most businesses, you ultimately want people to buy from you. The trick is that there are often many steps between the first time someone visits your website and a purchase. You need to continually get your visitors to take the next step toward your goal. Maybe you want them to read an educational article, register for an event, or download a resource like a catalog or how-to guide. Or maybe you just want them to contact you for a quote. These are the types of actions that can move your prospects further down the sales funnel until they’re ready to buy. Use strong calls to action (CTAs) on your website that let your visitors know exactly what actions you want them to take. These CTAs should make it easy and obvious for people to understand what you want them to do. Remember to keep your audience’s goals in mind too and always support your CTAs with benefits that encourage your visitors to take action. Now that you’ve got a foundation set with your goals, and a framework based on the 3 key questions your website needs to answer, you can start planning the major elements of your site. These fall into three general categories: design, content, and functionality. Let’s address these one at a time. Design is often where teams get hung up in the website planning process. Different people have varying opinions and taste when it comes to design, which means personal preferences often come into conflict. Establish a common ground by staying focused on the goals of the website, and how your design can help express who you are and why your customers should care. Rather than trying to control every aspect of the design, establish a creative direction, and let your web designers use their expertise to create something that aligns with your goals and your brand. If you have any existing branding elements start there. Things like logos, color palettes, typography, and styles give designers a good feel for who you are, and how to express your brand through design. Inspiration is another key part of the design planning process. Look at websites that you love, and identify what about them attracts you. Talk about websites that you dislike too, which can reveal things you want to avoid. Critique your current website (if you have one) and your competitors’ websites too, and discuss what you like or don’t like about those sites. Content isn’t just about what you say, it’s also about how you say it. Consider your tone of voice, and how you want your visitors to perceive you. For example, if you work in a medical field, you may want your patients to know you’re a trustworthy expert. Your tone of voice might be professional and empathetic. On the other hand, if you’re a B2C clothing retailer, a fun, informal tone may fit you better. How your website functions isn’t just about the coding and all the stuff that happens behind-the-scenes, although that is important. Functionality drives how both you and your users will interact with your website. Your goal in planning is to make sure that your website does everything you want it to do, and creates a great user experience for your audience. Next, think about the navigation for your site. Start sketching out how you want to organize the content for your site, and how you will make it easy for your users to find (We’ll talk about full sitemaps in a minute). There are many different styles and layouts for navigation – dropdowns, hamburger menus, sidebar navigation, etc. 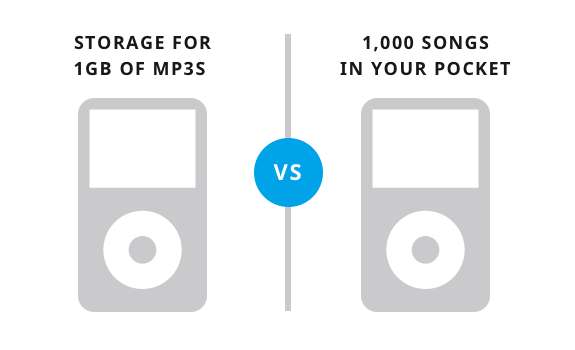 Certain types work better in different situations, but if you have preferences, let your web designer know. Don’t forget functionality for yourself, too. Some people just want their web designers to handle all website changes, but others prefer to make updates themselves. If you want a content management system (like Wordpress, for example) to be able to control content on the back-end, your website designer needs to know that at the start of the project. The timeline is often one of the biggest expectations. Talk with your designer about a realistic timeline, based on the size and complexity of your website. Recognize too, that timelines rely on both parties. Your designer should create a schedule of milestones and deliverables, but you also need to be responsive in providing timely input and responses. If you have an existing website, expect your website company to ask for access at some point during the process. Your domain and hosting information is critical before they can take your new site live, and things like Google Analytics data can help them make data-based recommendations about site structure and SEO-rich content. 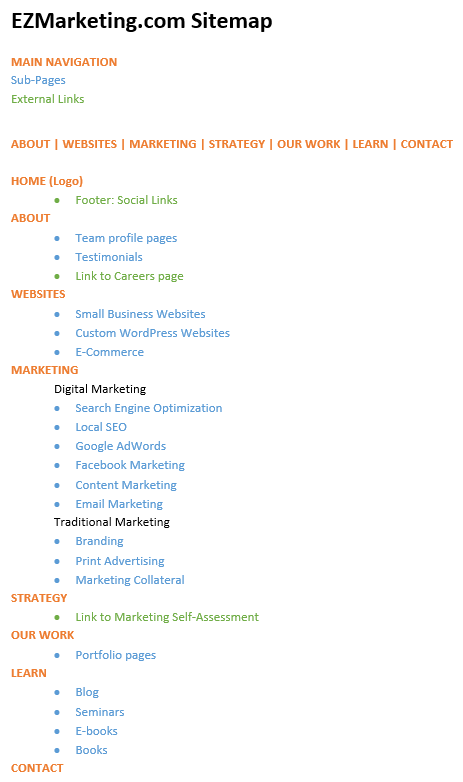 Sitemaps come in a variety of formats. For a small website, a simple bulleted outline of your page structure may be enough. Or, you may prefer to lay it out in a visual map, especially if you have a lot of pages. Color coding can also help visually differentiate page levels and structure. Ultimately, the format doesn’t matter, as long as everyone involved can see and agree to the overall organization for the site. You may create other documents as part of your planning process like inspiration boards, or copy drafts. And as you get into the design process, you’ll create more detailed mockups or wireframes. But the sitemap is a necessary output of any website planning process. 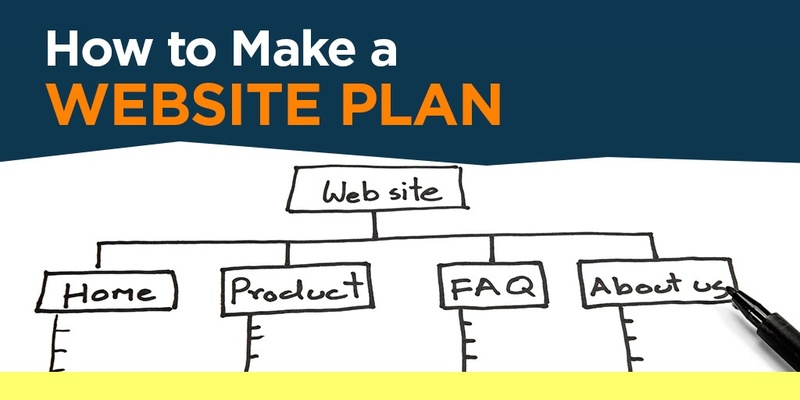 You wouldn’t start building a house without a blueprint, so don’t start building your website without a sitemap. Ready to start planning your next website project? Use our handy website planning worksheet. This template will walk you through the key questions you need to answer and discuss with your website designer before you start building your website. If you are looking for a website developer, check out our website design services that we offer.